Curing compounds and sealers -- curing compounds can accelerate the drying time, allowing coatings to be applied to the concrete sooner. There are several methods to determine moisture content and the rate of water vapor transmission of concrete. Some of the tests were created by the flooring industry and were intended to be conducted indoors, out of the sun, and in conditioned spaces. The industrial coating industry uses and sometimes modifies these tests to determine the concrete moisture for these applications. Plastic Sheet Test ASTM D4263: The plastic sheet method is a non-destructive, non-quantitative pass or fail test. The method requires sealing an 18x18-inch clear plastic sheet to the concrete. After 16 hours, if any condensation is found under the plastic sheet or the concrete has darkened, the concrete is considered too wet to coat. Unfortunately, there are many restrictions to using this standard outdoors due to variations in sunlight and high temperatures. Concrete Moisture Meters: These meters operate by sending an electrical current through the concrete to measure its resistance indicating the moisture level in the slab. Moisture meters can be very helpful since they give immediate results. 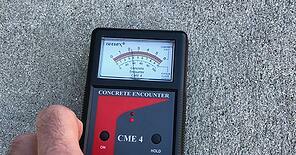 One brand of concrete moisture meter claims it can measure ¾” into the concrete. Most concrete coating applications require less than 5% moisture. Relative Humidity Using In Situ Probes (ASTM F2170): Holes are drilled into the concrete to a specified depth, and liners are inserted into the bottoms of the holes. The holes are then capped and allowed to equilibrate for 72 hours before inserting the probes and taking the relative humidity readings. Probes are generally inserted at 40% depth of the concrete. Usually, if the relative humidity (RH) is less than 80%, it is considered acceptable. Nondestructive RH Test: A variation of the ASTM F2170 is the nondestructive RH test, which is performed by sealing an insulated box or plastic sheet to concrete, waiting 24 hours, and then inserting an RH probe under the plastic sheet. If the RH is less than 75%, it is usually considered acceptable. It is important to understand the difference between moisture content and water vapor transmission rate. Moisture content measures surface moisture of concrete at a moment in time. 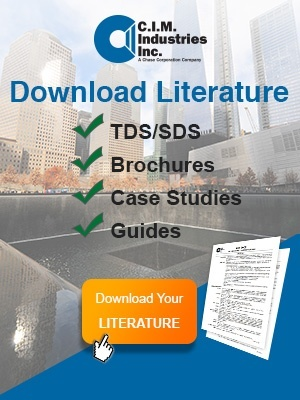 By contrast, tests used to measure water vapor transmission rate are conducted over time. Concrete can “pass” a static moisture test but fail a vapor transmission test in the same area. None of the tests are infallible, so two different types of tests always should be conducted prior to any coating application over concrete. Once moisture levels of concrete have been determined, what can be done to speed up the drying process? Air movement -- Air flow allows moisture to come to the surface, carries it away, and promotes further evaporation.10 mph of air flow can accelerate evaporation four times faster than no air flow. Heating -- After the initial cure, forced air heat can drive moisture from the concrete to the surface and allow it to evaporate faster. One of the biggest mistakes contractors make is using fuel-powered heat (e.g., propane, diesel or kerosene). These methods of heating actually can add moisture to the surrounding environment and introduce additional moisture onto the concrete surface. Desiccant DH uses chemical attraction to remove moisture from the air. Humid air passes a through desiccant material that traps the moisture. Then, hot air is used to release the moisture from the desiccant and move it away from the conditioned environment. Condensation DH cools the surrounding air below its dew point causing moisture to form condensation on the coils thus removing water from the air. In situations where moisture permeation cannot be controlled easily or where there is not enough time to adequately dry the concrete, an alternative approach is to use moisture mitigating primers such as CIM EMT Epoxy Primer. 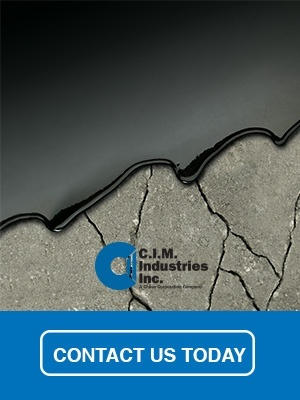 This moisture tolerant, penetrating epoxy can be applied to the concrete surface, and it will penetrate and block the moisture, allowing coatings to be applied without fear of blistering or disbonding.